Nokia published its financial results for the quarter ending in September – let's have a look at how the company did in its final quarter before selling its legendary phone business. Sales for Nokia Group decreased 22% year on year €5.662 billion, but operating profit went up to €118 million from a sizable loss of €564 million during the same quarter last year. Devices & Services – the division that Microsoft is set to acquire in the final quarter this year – accounted for €2.898 billion in net sales, down 19% year on year. The division posted an operating loss of €86 million, peanuts compared to the €672 million loss from last year. The good news is that most of the declining sales come from the feature phone department, which saw its sales decline 37% compared to last year. This coincides with a 27% drop in shipment volumes. The Smart devices shipments increased to 8.8 million units (up 40% year on year), beating the early estimates. 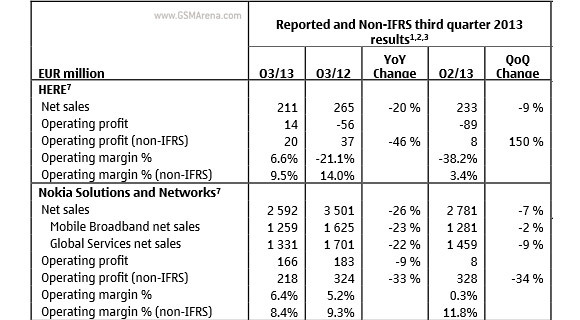 Smartphone revenue was up 28% to €1.254 billion. The rest of Nokia Group, which is not part of the Microsoft deal, includes the Nokia Solution Networks (or NSN, which used to stand for Nokia Siemens Networks until recently) and HERE. NSN saw declining net sales both year on year and quarter on quarter, but this business is almost as big as the phone business – sales were €2.592 billion . It is also doing pretty good with €166 million in operating profit. That's a sixth profitable quarter in a row. HERE is smaller with €211 million in net sales, but is profitable too, earning €14 million in operating profit. 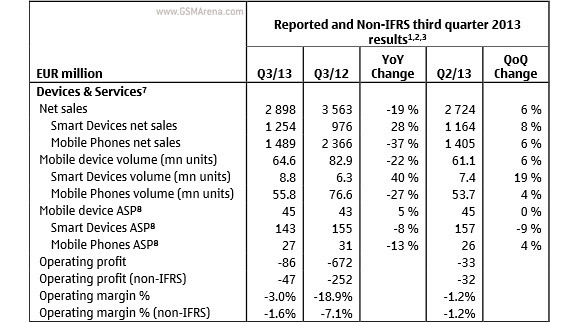 NSN and HERE were hit by weak seasonal demand and are expected to improve in Q4. A third division, Advanced Technologies, will be started up inside Nokia Group and it will round off the Finns' business divisions after Microsoft acquires the phone business. The Nokia press release points out that if Microsoft had already acquired the business, the sales for Nokia group would be just €2.9 billion instead of €5.7 billion, but the non-IFRS operating margin would have been 11.5% rather than 3.8%. This is a subtle way of saying that the phone division was operating at a loss and once that's gone, operating profit for Nokia Group will improve. This combined with the overall results, which exceeded expectations sent the Nokia stock 6.5% up at time of writing. Check out this document for more numbers and details (PDF). Yes I do. I own an iPhone 4S. Lumia 920, Lumia 520, Lumia 1020(tomorrow), Note II(bought 2 weeks ago, real cheap). Your point?